Roasted whole chickens are a delight when prepared in the perfect way and devoured upon with friends and family during ceremonial dinners. Last winter I already shared some tips of preparing that perfect roast in the French style (click here). However this time I thought of a twist. I am sure you must have often wondered how to bring a bit of novelty in the roasted bird for that special dinner. Well you can spice it up with some Indian twist. In India there is a form of roast called the tandoori. Generally meat is roasted in a special oven called the tandoor. Inspired from the tandoori, spices mixes are now available all over the world. 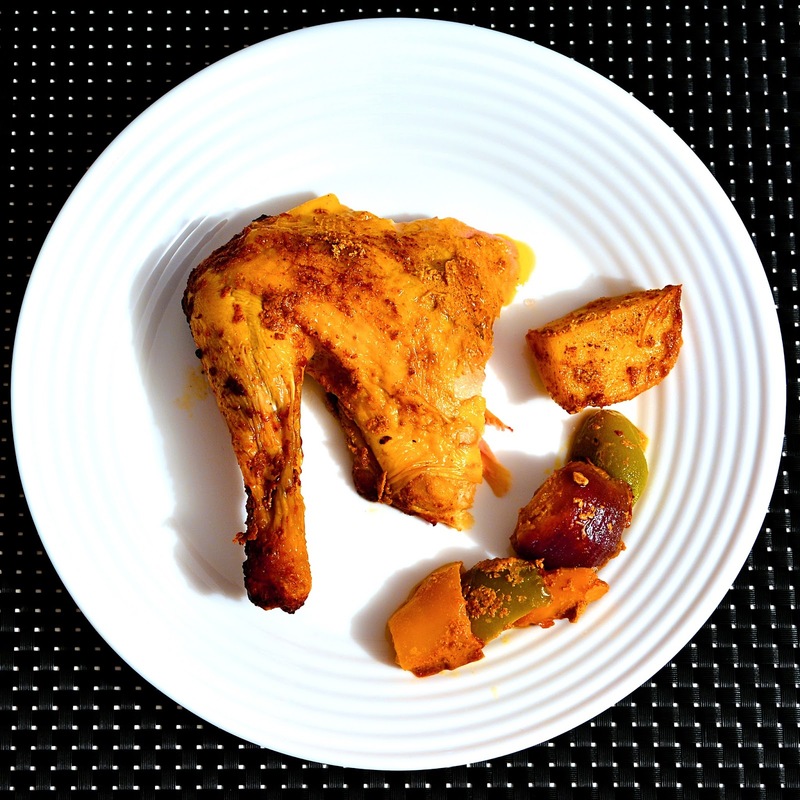 You can see my own boneless chicken tandoori recipe here (click here). The present dish is inspired from the tandoori chicken, however cooked in the European way of chicken roasts in a normal oven. So technically it is not a tandoori but a chicken roast with tandoori flavors. In addition, I have added potatoes and bell peppers which are prepared along with the roasted chicken and thus this makes it a complete one-pot meal. Here is the recipe and I would love to hear about your experience of bringing a twist to your roasts. Chop the onions, bell peppers and the potato into large cubes. Peel the cloves of the garlic. Message the chicken with butter. Make sure to insert the butter carefully beneath the skin of the chicken and message the flesh. Also place some small cubes of butter between the legs and wings of the chicken. Insert the onions and the garlic in the cavity of the chicken. 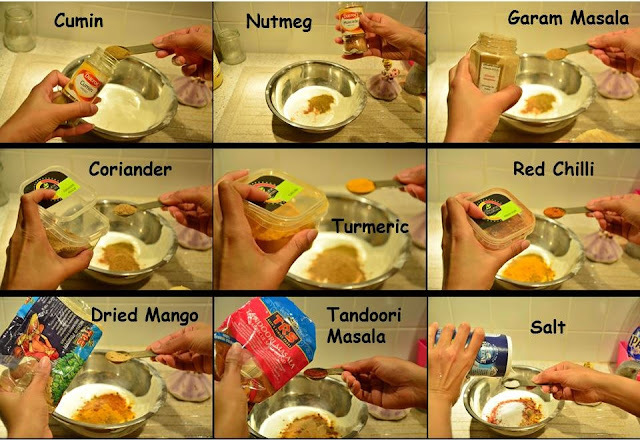 Take the yogurt in a pot and add the powdered spices and salt to it. Mix them well. Message the chicken with the yogurt and spice mixture in the same way as the butter. Now dip the bell peppers and potatoes in the remaining spice mixture. Place the bell peppers and potatoes in a roasting tray and then place the chicken on them. Pour the remaining spice mixture on the chicken and the vegetables. Insert 3 fresh coriander sprigs in the cavity of the chicken. Place 2 coriander sprigs below the chicken. Pour the sunflower oil on the chicken and the vegetables. Roast the chicken first for 45 minutes at 190°C. Take it out and bust the chicken (take the liquid collected on the roasting pan and pour it on the chicken and vegetables). Then roast the chicken again for another 45 minutes at 190°C. After roasting for 1h30min the chicken will look like this. Bust the chicken again and roast it again for 25-30 minutes at 190°C. After about 2 hours in the oven, the chicken and the veggies are ready. But now comes an important step. Cover the baking tray with an aluminum foil and let it rest for 1.5 hours. This helps to redistribute the moisture in the meat, making it juicy and succulent. The roasted chicken tandoori style is ready to be devoured. 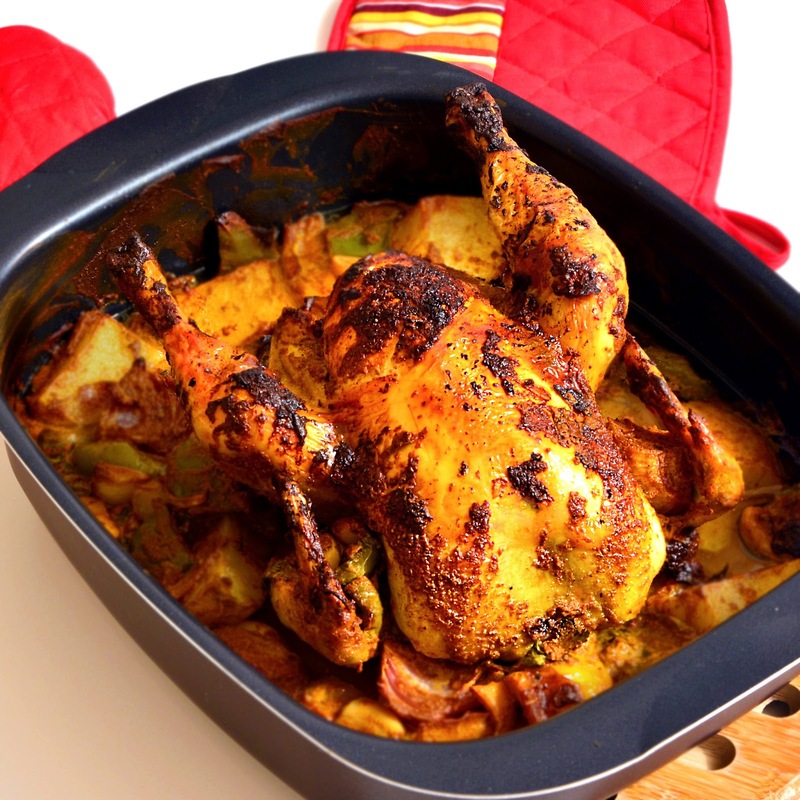 A roasted chicken done with Indian spices to add a tandoori twist. This is also a one pot meal as vegetables were roasted along with the chicken. Message the chicken with butter. Make sure to insert the butter carefully beneath the skin of the chicken and message the flesh. Insert the fresh coriander sprigs in the cavity of the chicken and place some below the chicken. Roast the chicken for around 2 hours at 190°C. Take the chicken out 2 times in between (after every 45 minutes) and bust it with the liquid from the roasting tray. After 2 hours, take out the chicken, cover the baking tray with an aluminum foil and let it rest for 1.5 hours. I do love chicken and this I must out some day. Wow I've never thought of making a whole roasted tandoori chicken! This is the perfect twist to holiday dinners! This looks absolutely delicious Mitanti!